Mercedes is updating the V-Class for 2019 to keep it feeling fresh. 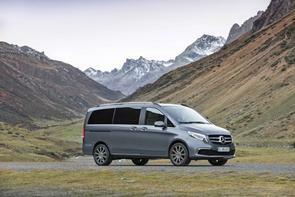 The biggest change is that the V-Class gets the latest 2.0-litre diesel engine, replacing the old 2.1-litre unit. For the first time, Merc's latest-tech 9G-Tronic nine-speed automatic gearbox is available as an option. Inside, there are new 'turbine' style air vents, an updated instrument pack and a new central infotainment screen, which comes with MercedesMe internet connectivity. There's the option of 'Tartufo' or 'Lugano' Nappa leather upholstery, and a mixture of satin wood, carbon fibre and brushed aluminium for the cabin trim.